As a Yoga student and practitioner, you may have heard about kirtan, mantras, and the Sanskrit language. But you may still be wondering, “What’s it all about, really?” Kirtan artist and dedicated Bhakti yogini Gita Zember has guided many students into spiritual bliss by sharing with them the sacred chants of ancient India and the power of the Sanskrit language. If you haven’t heard Gita chant, then you’re in for a real treat. We met with Gita for a quick interview and, fortunately, she brought her harmonium and we brought the camera. Gita opens with an invocation (in Sanskrit, of course!) in the first video and shares why Sanskrit is such a powerful language. In the second video, Gita discusses how the Sanskrit language has helped her students find their voice and connect to the divine. Off camera, she told us another story to illustrate the power of Sanskrit and talked briefly about her upcoming workshop at Yogaville. Gita: Just to further demonstrate the power of mantra and the power of the vibrations of the Sanskrit language, I’ll share with you this story. I was in Varanasi, India, six years ago and I was traveling by myself for the first time. Before that, I had been traveling with a group. I walked up and down the sacred river for there for three days, and every day that I was there, the same mantra repeated in my head endlessly: Sri Ram Jai Ram Jai Jai Ram. I thought it was peculiar because I was expecting to be chanting other mantras in the sacred Shiva town on the sacred Mother Ganga River… but no, this was the one that came to me. On the fourth day that I was there, I sat along the Ganga and when I got up from chanting, I saw that very same mantra was painted on the side of a wall. I had no idea—I hadn’t seen it while I was walking—and yet that mantra came to me there. That, to me, proved that the mantra and its vibration were strong and palpable. 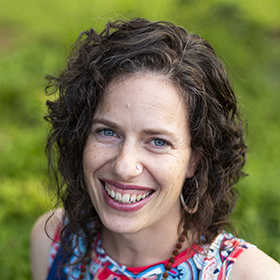 Gita: The workshop that I’ll be leading at Yogaville is the workshop that changed my voice. These teachings really helped me find an opening in my voice which helped me to share the power of Sanskrit and Bhakti Yoga with others. We will be exploring not only the Sanskrit alphabet and tuning in to that vibration, but we’ll be chanting mantras and there’ll be plenty of kirtan. We’ll also experience other aspects of the Bhakti Yoga tradition, including puja (worship services) and japa mantra (mantra repetition). We will also be practicing Swakriya Yoga, which incorporates the elements, the vibrations of the mantras, mudras (hand gestures), simple, simple Yoga postures that anyone can do, and the chakras (energy centers). It’ll be a beautiful weekend of using these timeless tools to connect with the divine.